I have moved to a new blog template to give a clearer reading experience and allow for the placement of larger images. Let me know what you think! 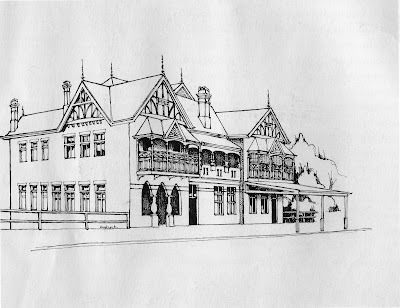 This week we are in the Petrie Terrace precinct, and I am indebted to the book "Petrie-Terrace Brisbane 1858-1988", R Fisher & S Woolcock; from where the wonderful Steve Woolcock sketches were sourced. The picture below shows one of Brisbane's most talked about hotels currently. It is the Normanby Hotel, situated just outside the CBD at Red Hill, near the busy Normanby Fiveways. Its proximity to the city, and to Lang Park Suncorp Stadium, makes it extremely popular for the footy fraternity. Apparently Sundays here are huge, probably helped by cold beer and barbecued beef around the beer garden. An old Moreton Bay fig has been included in the configuration of the exterior of the hotel - a nice touch. The hotel has had its share of notoriety lately. State of Origin legend Alfie Langer was photographed dancing semi-naked there after a recent football game where his team, the Broncos, lost heavily. This was despite the fact that the Broncos were reported to have given up going to the place because of other unsavoury incidents. But all of that isn't just a new phenomenon - I found a newspaper article from 1893 where a drunken brawl at the Normanby resulted in a murder charge. I'm not suggesting that the Normanby suffers from constant problems, but that, like many licenced establishments in Australia today, it experiences alcohol-related issues from time to time. Anyway, the hotel is old. Built in 1890 and replacing an earlier hotel on the same site that had opened its doors in 1872, the Normanby was designed by JB Nicholson (he also designed the Princess Theatre) for the Burton family who had owned the original hotel too. Here it is (below), pictured circa 1891. I believe this image is actually a photograph of an oil painting. Alterations were subsequently made to the structure in 1917, and the architect then was GHM Addison. 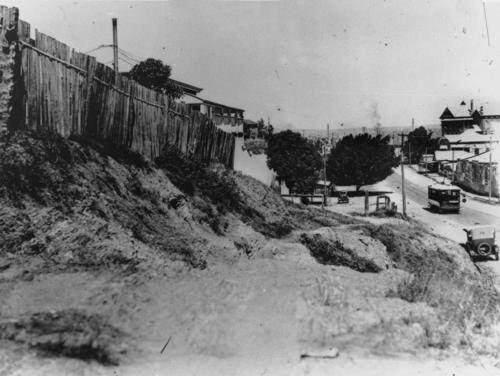 And here is a later photo, from around 1929, taken from Kelvin Grove Rd. 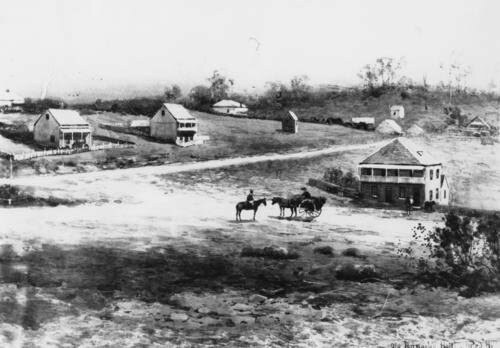 The Normanby Hotel is at the back on the far right of the picture. Note the fig trees - those big ones in Kelvin Grove Rd were the subject of community action when it was proposed to relocate some of them for the construction of the Northern Busway. i think i have been in every pub that you have featured in your blog until now - but i have never been to the normanby. great post! It's many, many years since I have been inside, but I used to drive past it every day. It's raining here in Brisbane, and I recall a couple of very pleasant rainy Saturdays spent in the bottom bar (Kelvin Grove Rd) when my cricket match was washed out. Great new layout! Easy to read. I agree with Luke. Nice and clear. And spacious! Thanks - that's what I was hoping for! That 1891 photo doesn't show anything that looks remotely like the hotel so I assume that what's there now mostly dates from 1917, a date which matches the style I rekon.